A shot of Dusty Baker just seconds after Chris Nelson stole home to give the Rockies a 6-5 lead and their eventual 7th straight victory. I think he swallowed his toothpick... Dude. How many times have we said we've seen everything, only to see something we've never seen before that blows everything we've already seen out of the water? At least once a week with these Colorado Rockies. It was the first steal of ML career. It happened in the 8th inning. It was the game-winning run. He stole home... off a right-handed pitcher. That just doesn't happen! It shouldn't happen. It should never happen, yet it happened today. I have a new formula for the sabermetricians out there. Situation + Circumstances + Atmosphere + Guts + Milestone in a young baseball player's career = The greatest stolen base of all-time! By my math, Nelson is the greatest base stealer of all-time. Well, the Reds jumped all over Jason Hammel early, scoring one in the first and four more in the second. The Reds were aided in those innings by a couple blown calls and some sloppy Rockies defense. From that point on Hammel was excellent. He wasn't brilliant by any stretch, but he battled through all the early stress and some middle inning traffic to end up with a 7 IP, 8 H, 5 ER, 1 BB & 6 K line. Damn right I'll take that. The Rockies began their comeback with a 2-run bomb to CF by Jason Giambi (Highlight) in the 4th. From there it was Dexter Fowler doubling home EY Jr. from first on a double that was actually cutoff off in the gap (Highlight). EY's speed proved to be a difference maker once again. In the 7th, the Rockies mounted a rally on Logan Ondrusek. 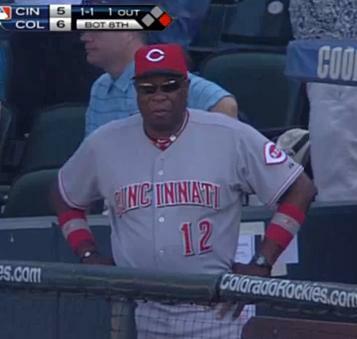 Dusty Baker turned it over to Aroldis Chapman. Jim Tracy countered with Jonathan Herrera, who did what he needed to do. He put the ball in play and the Rockies got their 4th run. Chapman rebounded to get CarGo to 6-4-3 DP. Then came the 8th. Tulo tied with a towering blast to RF (Highlight). Jason Giambi drew a walk. Chris Nelson pinch ran. The wheels fell off the Reds. Baseball history was made. Matt Reynolds did his job out of the pen. Matt Belisle did his and was rewarded with a win. Huston Street struck out the side in the 9th to earn his 17th save. What an awesome day at Coors Field. The Arizona Diamondbacks are in town and that makes me nervous. These guys have caused the Rockies some trouble. It's a classic situation where an emotional letdown takes place. The Rockies can't afford that. As well as everything is going right now, this team still has little to no margin for error. A little Thursday afternoon baseball leading into the NFL season opener. A chance to complete a four game sweep over the first place Cincinnati Reds. Does it get any better than this? ?